The original Crybaby Q-Zone has been a mainstay on Kerry Kings pedalboard through years of tours and recording sessions. Its unique design allows Kerry to create a focused and penetrating “fixed-wah” lead tone to cut through a band as thick as Slayer! 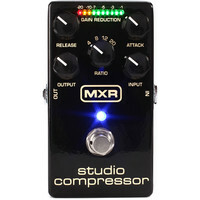 The MXR M76 Studio Compressor Pedal is a compact studio compression pedal unit featuring 5 modulation knobs. This compact yet powerful compression pedal features a range of controls that let you fine tune and craft the compression levels to suit your needs. Feedback monitoring is provided by the convenient LED status meter allowing you to see your gain reduction even in the darkest gigs. The MXR Micro Flanger features many of the classic sounds from the MXR M117 in a smaller and more convenient package. Two simple knobs make it easy to use the pedal – a Speed knob to control the rate of cycling and a Regeneration knob to manage the overall intensity. Featuring the same short circuit and overload protection of the DCB10 the MXR dc Brick however handles twice the power! Each 9V output has a convenient red LED that illuminates if there is a short. The MWR Bass Preamp gives you a pristine preamp for bass plus a studio quality Direct Out in a compact package. Clear tone without hogging valuable pedalboard space! The MXR Bass Preamp is ideal for adding new voice to an old passive bass sweeten up any amp or add something special into a particular track. Get your tone just the way you want it and send it straight to the house pre or post EQ using the Direct Out. The MXR Custom Shop LA Machine serves up thick shaggy retro fuzz thats tailor-made to drive the raw sounds of 70s-style hard rock and modern garage rock. This effects pedal is incredibly reliable for gigging artists as the die-cast outer shell is designed to take an absolute pounding onstage. The controls have a high-quality feel and the pedal is small and discreet enough to slot into any pedalboard or setup very nicely. This all-analog pedal uses bucket-brigade circuitry to create classically lush liquid textures that you just cant get with digital circuitry. Rate Level and Depth controls as well as knobs for cutting High and Low frequencies allow ultimate tone control. 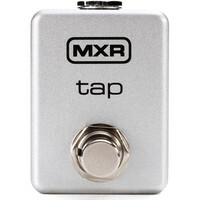 The MXR M199 Tap Tempo Pedal is a ultra-compact tap tempo switch featuring adjustable tip/ring configuration giving you the ability to control the delay time in relation to delay pedal types. This simple and affordable tempo pedal is designed to work in conjunction with the MXR Echoplex Delay unit but will also work with other delay units. Simply connect your Tap Tempo Pedal to your Delay unit via a standard instrument cable and youre ready to go. The MXR M288 Bass Octave Deluxe is a dual voice octave pedal that offers analog tone true bypass and a huge variety of tonal options. The MXR Iso-Brick Power Supply is small and light with tons of quiet noise-free DC power on tap ready to run a wide range of pedal types without crowding or weighing down your pedalboard. Give your voice an amazing effect! With the MXR Talk Box you get great tone sculpting while maintaining the effects legendary character. The new Distortion III joins the ranks of MXR classics-such as the Phase 90 and Dyna Comp-Â?setting a new benchmark in distortion tone and quality. Developed from the ground up using carefully selected components the D-III delivers everything from sweet singing overdrive to massive distortion crunch! 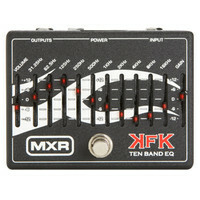 The MXR M300 Reverb Pedal is a compact versatile FX pedal featuring 6 different reverb settings. The six reverb settings included in this FX pedal are hand-pick and meticulously crated by MXR to deliver rich high-end reverb styles. The Phase-90 sized box features a simple 3-knob design with each knob assigned to a different function. The M300 features decay and mix controls giving you maximum control over your sound. 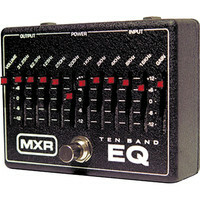 The MXR M-108 Ten Band Graphic EQ provides extreme control over the 10 most crucial frequencies for guitar. Please note this item was returned unwanted from a customer. The original boxing is scuffed and all the seals are broken.Otherwise the unit itself looks and operates as new and has only been used a couple of times. This is a great opportunity to buy a fully functioning product at a discounted price supplied with a one year warranty.